County Supervisor Adam Hill made me do blow in college. Why the admission? Before I get too far into this week’s column, I need to get a few things off my chest. My therapist said it would be good for me. CAPSLO Homeless Services Director Dee Torres made me cheat on my love pillow—with another pillow I merely “liked.” SLOPD Chief Stephen Gesell directly led me into an underground pai gow circuit where I subsequently lost my left pinkie. Beloved mascot Downtown Brown makes me drink beer before I do tequila shots, which gets messy. There. I feel better. Mostly because I’ve foisted the blame for my problems onto other people. Notable ones! And any blowback I get from these admissions will be on their heads, too. Who cares if the connections are true or not? The important thing is that I’m not alone here. In fact, I’m poised to become a martyr. I’m taking a page from CalCoastNews founder and reporter Karen Velie’s playbook. Since I tend to hang around the New Times office—where there are company perks I don’t have at home, like hot coffee, toilet paper, and oxygen—I recently heard the staff discussing what to do about the news that the local web publishing magnate had been arrested on suspicion of driving under the influence on Aug. 13. They all seemed like they were thinking long and hard about whether to write anything at all, and the scales were certainly tipping toward little to no coverage, since people get arrested for such hiccups all the time and there were no injuries. And given New Times’ rocky history with Karen and her compatriots in the past, her crew would more than certainly criticize any coverage as the bitter juice of sour grapes. Her BFF, KVEC radio talk show host Dave Congalton, has called for a New Times staff member to be fired for less in the past (something he subsequently and angrily deleted from an online message board when—oops!—he realized the “facts” he was basing his battle cry on were wrong), and I don’t blame my co-workers for wanting to avoid that smugness-induced headache. Especially when weighing the cost of coverage with the benefit to the readers—you know, the sorts of things legitimate news outlets do. Then Karen’s own site went and did the story. CalCoastNews published “CCN reporter arrested on DUI charge for .06 blood alcohol level” on Aug. 20, a move that looked noble at first, but more calculated with each word that went by. When the day arrives that I am inevitably arrested after doing something stupid, my fervent hope is that my public reaction is everything Karen’s wasn’t. I abuse my power all the time in this column—“power” being the sway I have over my slavish audience—but there’s abuse, and then there’s abuse. As members of the media, we’re supposed to act in the public’s interest, but—and I can’t stress this enough—doing so is more than afflicting the comfortable. It involves that, sure, but it also takes prudence, wisdom, forthrightness, and other big words that make you sound like you’re a responsible person. It takes a conscious decision not to abuse your resources in mounting a flailing, absurd defense if you find yourself at the receiving end of something for which you’ve held other people’s feet to the fire. • Post a picture of the arresting officer, linking him somehow to your poor decision making. Ignore that your own organization frequently publishes mugshots and lurid details of supposed crimes for just about everyone else. • Run a story that cherry picks facts and allegations. If the police report states you blew an initial .079, then a .07 and a .06 in your blood-alcohol breath tests, say only that you were arrested for a .06. Don’t mention anything about the number of attempts it took to finally get a legitimate reading. It’s helpful to establish a track record of not telling the whole story before mounting this defense, because then it won’t look like you’re trying specifically to cover something up just this once. Our business is about trust, and it needs heroes. Not self-styled martyrs helped onto pedestals by radio personalities more interested in lobbing zingers and blindly standing by their charges than in fairness and truth. Oh, and in case I get hammered for this column, Steve Moss’ ghost made me write it. Shredder likes nothing quite so well as a genuine mea culpa. 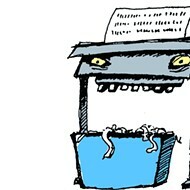 Send your confessions to shredder@newtimesslo.com.